Spacescientist William ?Bill? Borucki is a soft-spoken, pleasant person who grew upin a small town in Wisconsin where he liked to build and launch rockets. Hestill does, and he convinced NASA to build and launch Kepler, the firstspacecraft capable of finding Earth-size planets orbiting other stars. Billdisplays a number of similarities to another mild-mannered Midwesterner, a guynamed Clark Kent. As the force behind what many call ?NASA?scoolest mission,? Bill summoned veritable superpowers to get the innovativeKepler mission off the ground. Knowing what he and his team have accomplished,you get the feeling there might be a giant ?S? hiding under that unassumingshirt and tie. WhileSuperman could fly to other worlds with relative ease, he didn?t have tonavigate the maze of changing requirements, reallocated funding, technicalissues, and political challenges that Bill has helped steered the Keplermission through. Even with X-ray vision, he might not have been able to foreseethe obstacles. But he was there to watch his dream come true on March 6 whenthe Keplerspacecraft took off from Cape Canaveral, faster than a speeding bullet, onits way to search for other habitable worlds. Bill grewup in Delevan, Wisconsin, a great place for a boy who loved science andbuilding things. He was president of the school?s science club - the studentsliked to reject the teacher?s suggestions for projects and pursue their ownideas. ?We decided to build a transmitter to contact UFOs,? he said, ?so Ibuilt the ultraviolet transmitter and others built the visible and infraredtransmitters and a magnetometer. I don?t think any of them worked all thatwell, but we had a great time. I learned so much trying to build these things. Youdon?t always have to succeed to learn a lot.? Young Billalso belonged to a rocket club, and he got interested in amateur radio andbuilding electronic equipment and antennae. He enjoyed communicating with otherpeople around the world. Bill remembers the very dark night sky and how it litup with stars during the new moon. He and his friends built telescopes andcameras to photograph the stars. In the summertime, they rode their bicycles tothe Yerkes Observatory at nearby Lake Geneva to look through the 40-inchtelescope. ?Great big things were nice to look at," he said, ?but the funwas to build things yourself from your own ideas, because then you understoodhow they worked.? His parentswere not science-oriented but they were encouraging. Bill and his father builteverything from a backyard tower to hold his antenna to soapbox derby cars andmodel airplanes. Bill attended the University of Wisconsin at Madison and hefound college to be a wonderful experience. He especially enjoyed meetingpeople with different ideas. Bill earnedboth a B. S. and M. S. in physics, then applied for a job at NASA, the onlyplace he considered. ?I wanted to work on spacecraft,? he recalled, ?and NASAwas it.? He got offers from both NASA?s Ames Research Center in NorthernCalifornia and Lewis (now Glenn) Research Center in Cleveland. His fatheradvised him to go west, and he?s been at Ames ever since. ?I?ve really enjoyedworking at NASA. It has always been fascinating,? he said. ?It?s a great way togo through life, attacking worthwhile problems with a good team.? In hisearly years at Ames, he conducted studies on the radiation environment of entryvehicles. When he found that the existing spectrograph didn?t work for thetypes of extreme tests they were conducting, he designed and built a new one.The results of his investigations were used in the design of the heat shieldsto protect the Apolloastronauts during re-entry into Earth?s atmosphere. Next heworked in the Theoretical Studies Branch where they studied the atmospheres ofEarth and other planets and built theoretical models of the atmosphere tounderstand how mankind?s influence would change it. His group published manypapers on how ozone would be affected by nitrogen oxides. ?We didn?t predict ahole in the ozone layer,? he said, ?but we did predict that the decrease wouldbe seen first at the poles.? Anotherarea of Bill?s research concerned the effects of lightning activity inplanetary atmospheres. He conducted a variety of laboratory studies andparticipated in spacecraft observations to determine the amount anddistribution of lightning activity on other planets. He also earned a second M.S. in meteorology. During thistime Bill?s interests merged. He focused his knowledge of spectroscopy andphotometry and his theoretical studies of planetary atmospheres into thinkingabout how photometry and spectrometry could be used to find otherplanets. Theserevolutionary ideas resulted in a paper he published in 1984, ?The photometricMethod of Detecting Other Planetary Systems.? The following year he published?Detectability of Extrasolar Planetary Transits.? He pursued his ideas withpatience and persistence and developed experimental systems to prove thetransits method of finding extrasolar planets. In 2000 he proposed aplanet-finding mission to NASA, in response to a call for Discovery missionproposals. 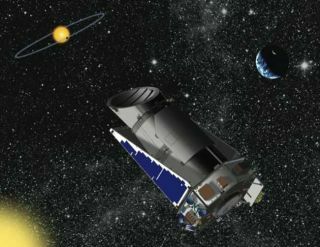 The Kepler Mission was selected as the 10th Discovery Mission inDecember 2001. Keplerencountered many unforeseen and unpredictable delays throughout the variousdevelopment phases. ?We?re doing something new that?s never been done,? hesaid. ?It means there are going to be surprises and difficulties to surmount.We have a wonderful team of people from Ames, JPL, universities, non-profitsand other NASA centers. I admire very much the people at NASA Headquarters whosupported us through all our difficulties. It?s been great working with everyone.? Kepler has28 co-investigators on the science team and dozens of other collaborators. InEurope a team of over 200 scientists has formed the Kepler AstreroseismicScience Consortium. They will use Kepler data for the first time to see what?sgoing on inside a star - how fast it rotates, how much of the hydrogen has beenburned, and the star?s density. Bill?sfamily joined him to witness the launch in Florida. He met his wife in college,and they have 3 daughters and 8 grandkids. ?I?ve been working on this idea for25 years,? he said, ?so my kids and grandkids have heard about it since theywere born. They were delighted to be at the launch, which was magnificent. Thesolid rockets looked like sparklers as they fell away from the rocket. It waslike the spirit of all the team was being launched into space after dedicatingso much time and effort to get it into orbit.? The KeplerMission has dominated Bill?s life in recent times, often 10 hours a day, 7 daysa week. He said that seeing Kepler launch and knowing it will answer a very bigquestion - ?Are there lots of Earths out there or are we alone?? - istremendously satisfying and worth the 25 years of effort and sacrifice that?sbeen required. Everyone is very excited about looking at the results andunderstanding the implications. The first download of science data was received in Juneand the search for planets has begun. Bill?sadvice for students who have an interest in space exploration is to take thecore subjects of mathematics, physics, chemistry and engineering. ?But you alsoneed to take courses to make sure you can write and speak well,? he said. ?Youwill spend a lot of time communicating your ideas and interacting with othersto solve problems. If you can?t inspire others to work on these ideas with you,you?ll never do it by yourself. You really need to speak clearly about yourgoals and why they?re important.? Bill sets agreat example for pursuing your dreams, convincing others of their value, andpersevering to realize your goals. He looks forward to seeing what questionsthe next group of young scientists will ask and what answers they will uncover. Scientists,computer scientists, engineers and educators at the SETI Institute are a partof Bill Borucki?s team for the Kepler Mission.